Alleviating suffering from physical ailments is one of the greatest contributions a doctor can make for his patients. Chiropractic allows me to help patients recover from physical ailments and find the root cause without adverse side affects. I believe health isn’t found in a bottle of pills. As your chiropractor, we will discuss more intelligent choices so you can live a better, happier life. 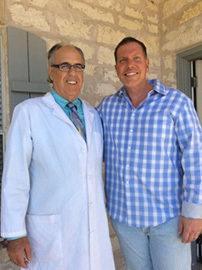 I meet Charles Rassel, Doctor of Chiropractic, when he adjusted me in Switzerland. He explained that many health problems originate from nerve pressure on the spinal column and chiropractic relieves that nerve pressure so the body can heal itself. The philosophy and science made sense to me. Soon thereafter, I attended Palmer College of Chiropractic in Davenport, Iowa where I completed my doctorate. 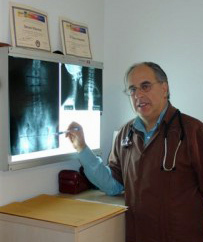 At Klayman Holistic Chiropractic, my first objective is to relieve patients of their discomfort. My second objective is to help them to maintain that relief throughout their life. After examination and testing (For example: orthopedic, neurological, physical exam, kinesiology tests, blood analysis, case history, X-rays) we’ll decide together if the goal is symptomatic or symptomatic plus fixing the root cause. It really satisfies my soul to see a patient get such a dramatic results in such a short time. Austin feeds me…. I’ve lived here for over 30 years and love it. My son, Josh along with his wife Lindsey and their daughter Scarlett live in north Austin. I enjoy motorcycling riding, golf, live music, travel, or heading to the Victoria Crown for the latest movie. Personally, I eat a vegetarian diet, find some quiet time every morning and evening to de-stress, I almost always choose a non-prescription method to treat so if you need suggestions, please just ask or email me. I’m on my cell phone all the time. How can I help you with a safe and natural option to your health issue? Give our South Austin chiropractic office a call, click on the “email us” icon or sign up for the newsletter so I can help you take your first step towards better health.